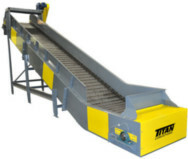 The versatile Titan steel belt conveyors can be used to handle any type of metal scrap – from tiny chips, turnings and bushy material, to wet or dry materials, in large or small amounts. 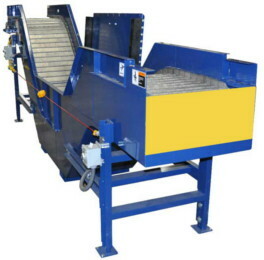 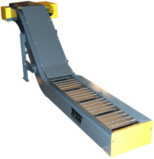 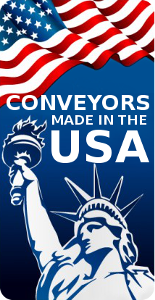 4″ and 6″ pitch hinged steel belt conveyors are ideal for conveying larger scrap. 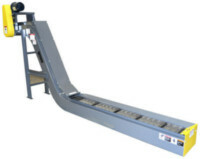 Like foundry or in any application with a heavy load. 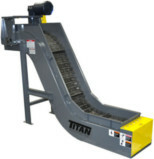 A Titan steel belt conveyor is capable of combining horizontal and elevated movements. 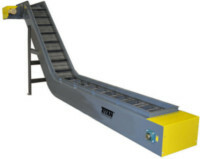 Our exclusive Radial Sidewings eliminates the gap between sidewings on to provide a jam free operation and a more efficient running conveyor.